The World's biggest swimming pool is in found in In Algarrobo near Santiago. The driest place on earth, the Atacama Desert is in Chile. Chile is the world’s fifth-largest wine exporter, with 100 wineries. 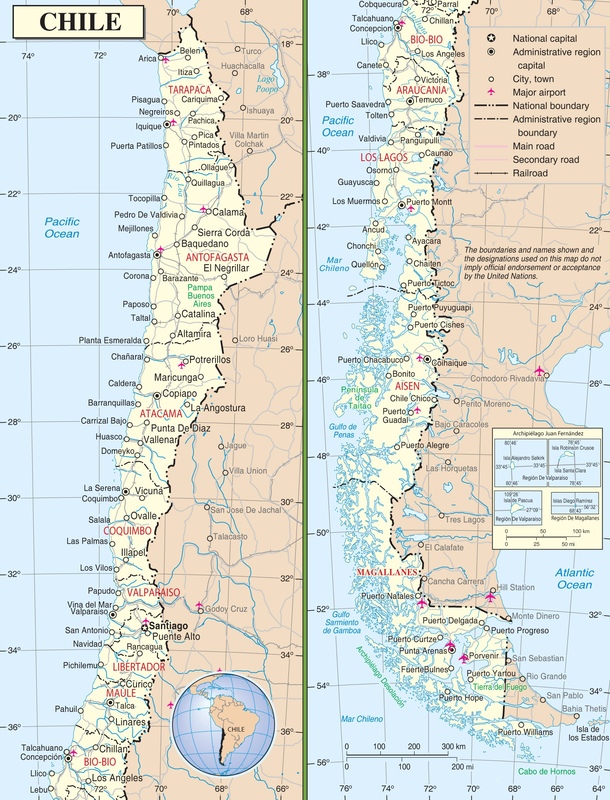 Chile is the longest country in the world from north to south at 2,653 miles. Husbands and wives in Chile do not share a same, common last name. Wives use their maiden names. Pisco is Chile’s national drink. It is home grown in the country and made with a mixture of a few different ingredients. Lemon juice, ice, sugar, and beaten egg whites are used to make Pisco sour, which is the most common version of the national drink. The largest earthquake ever recorded on earth, measuring 9.5 on the Richter scale, hit Chile in 1900. Iquique is a great town to walk around or just chill on the beach. The water is cold but feels refreshing after laying out in the arid landscape. The Patagonia and Torres Del Paine are incredible. Rent a car and drive around Santiago, Algarrobo, Vina Del Mar and Renaca. Check out the penguin colony on Isla Magdalena.